Prior to becoming a US territory, Hawaiʻi’s modern army consisted of a royal household guard and militia units. By the 1860s, the Hawaiian military had been reduced to the Royal Guard, a unit assigned to guard the sovereign. They were also known as the Household Guard, Household Troops, Queen’s Guard, King’s Own and Queen’s Own – they guarded the king and queen and the treasury and participated in state occasions. The Committee of Safety, formally the Citizen’s Committee of Public Safety, was a 13-member group also known as the Annexation Club; they started in 1887 as the Hawaiian League. The Committee of Safety was made up of 6-Hawaiian citizens (3-by birth and 3 naturalized (1-former American, 1-former German & 1-former Tasmanian;)) 5-Americans, 1-Scotsman and 1-German. Most were not American, and, BTW, none were missionaries and only 3 had missionary family ties – the Missionary Period ended in 1863, a generation before the overthrow. However, a recent revelation (part of the Provisional Government Papers at the Hawaiian Mission Houses Archives and Historic Site) notes a January 17, 1893 ‘Private’ correspondence between Stevens and Dole that suggests that the US de facto recognition of the Provisional Government had been prepared prior to the takeover of the Government Buildings. Mary Hannah Krout was born on November 3, 1851 in Crawfordsville, Indiana, daughter of Robert Kennedy Krout and Caroline VanCleve Brown Krout. She was the oldest of eight children, and after their mother died early in Mary’s life, they were raised by their strict father. Mary became one of the leading feminists in Indiana, perhaps in reaction against the strict social structure that she and her other sisters were forced to follow by her father. She was educated in Crawfordsville, first in subscription schools, then in Crawfordsville public schools. Like many women of her time, Mary Hannah chose teaching as a career and taught in the Crawfordsville schools for about a dozen years. But her passion was for journalism, a field almost completely closed to women in the 1800s, except for occasional articles on homemaking and other feminine pursuits. First writing for area newspapers while she was still teaching, in 1879 she got a job on the Crawfordsville Journal and contributed to Indianapolis and Cincinnati papers. On the Journal, besides reporting, she wrote a gossip column under the pseudonym “Heinrich Karl,” a lively, perhaps libelous account of Crawfordsville people and their activities, which was also sold to other papers. In 1881 she became associate editor, and in 1882 was hired as editor by the Terre Haute Express. Long hours eventually forced a partial retirement during which she kept writing, but was unable to work at a job. 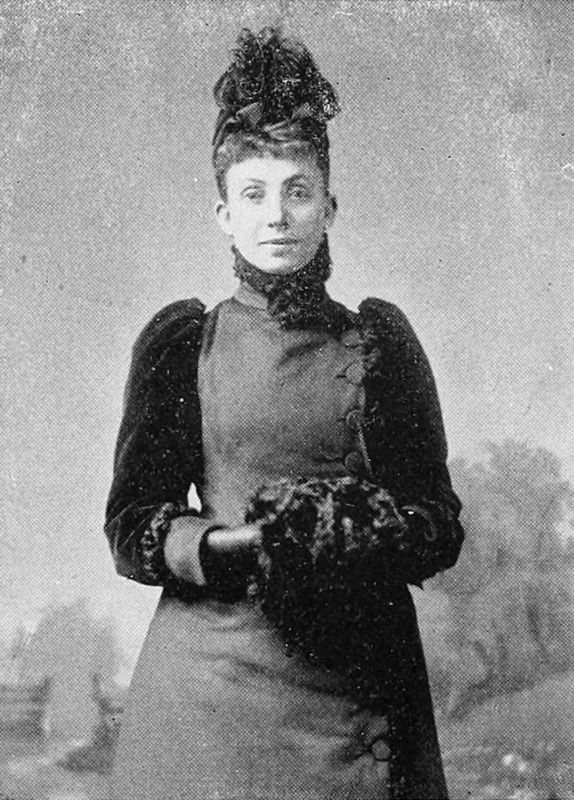 Krout’s career took a great leap forward in 1886 when she began a ten-year affiliation with the Chicago Inter-Ocean, presumably as a result of her position as a writer for the Chicago Interior. That paper sent her to Hawaiʻi to cover the installation of the new provincial government. This led to her first book, Hawai‘i and a Revolution, in 1898, and later, two biographies of prominent Hawaiian women. In 1900, Alice’s Visit to the Hawaiian Islands (an ‘imaginary journey’ through the Islands) was published. On January 18, 1893, letters acknowledging (de facto) the Provisional Government were prepared by the Imperial German Consulate, Austro-Hungarian Consulate, Consul for Italy, Russian acting consul, Vice-Consul for Spain, Consulate of The Netherlands, Royal Danish Consulate, Consulate of Belgium, Consul for Mexico, Consulate of Chile, Office of the Peruvian Consulate, Consul-General and Charge d’Affaires of Portugal, Consulate and Commissariat of France and Chinese Commercial Agency. On January 19, 1893, the British Legation and His Imperial Japanese Majesty’s Consulate-General acknowledged the Hawaiian monarchy has been abrogated and a Provisional Government established. The Provisional Government convened a constitutional convention, approved a new constitution and the Republic of Hawaiʻi was established on July 4, 1894. Shortly after (from August 1894 through January 1895,) a number of letters of formal diplomatic recognition (de jure) of the Republic of Hawai‘i were conveyed to the Republic of Hawai‘i President Sanford Dole. An August 7, 1894 ‘office copy’ letter notes US President Grover Cleveland wrote to Republic of Hawai‘i President Sanford B Dole, saying “… I cordially reciprocate the sentiments you express for the continuance of the friendly relations which have existed between the United States and the Hawaiian islands”. “There remained, therefore, the annexation of the islands and their complete absorption into the political system of the United States as the only solution satisfying all the given conditions and promising permanency and mutual benefit. The present treaty has been framed on that basis”. Meanwhile, the breaking of diplomatic relations with Spain as a result of her treatment of Cuba so completely absorbed public attention that the matter of Hawaiian annexation seemed to have been forgotten. The war drama moved swiftly. The destruction of the battleship Maine in Havana harbor precipitated matters, and on April 25, 1898, President McKinley signed the resolutions declaring that a state of war existed between the United States and Spain. On May 5, Representative Francis Newlands, of Nevada, offered a joint resolution addressing the annexation of Hawai‘i. Though considerable opposition to annexation was still manifested in the House, the Newlands resolutions were finally passed. The resolutions were immediately reported to the Senate, which had been discussing the treaty for nearly a year. That body referred them to its Committee on Foreign Relations, which in turn at once favorably reported them. The US Constitution, Article II, Section 2 states: “(The President) shall have Power, by and with the Advice and Consent of the Senate, to make Treaties, provided two thirds of the Senators present concur …” The following day, July 7, 1898, President McKinley signed the Newlands Resolution it into law. “There was no ‘conquest’ by force in the annexation of the Hawaiian Islands nor ‘holding as conquered territory;’ they (Republic of Hawai‘i) came to the United States in the same way that Florida did, to wit, by voluntary cession”. Shall the following proposition, as set forth in Public Law 86-3 entitled ‘An Act to provide for the admission of the State of Hawaii into the Union’ be adopted? 1. Shall Hawaii immediately be admitted into the Union as a State? – 94.3% voted in support. While Hawaiʻi was the 50th State to be admitted into the union on August 21, 1959, Statehood is celebrated annually on the third Friday in August to commemorate the anniversary of the 1959 admission of Hawaiʻi into the Union.